Jesus took Peter and James and his brother John, and ascending a very high mountain with them apart, showed them the brightness of His glory; because, although they had recognised the majesty of God in Him, yet the power of His body, wherein His Deity was contained, they did not know... For the unspeakable and unapproachable vision of the Godhead Itself which is reserved till eternal life for the pure in heart, they could in no wise look upon and see while still surrounded with mortal flesh. The Lord displays His glory, therefore, before chosen witnesses, and invests that bodily shape which He shared with others with such splendour, that His face was like the sun's brightness and His garments equalled the whiteness of snow. 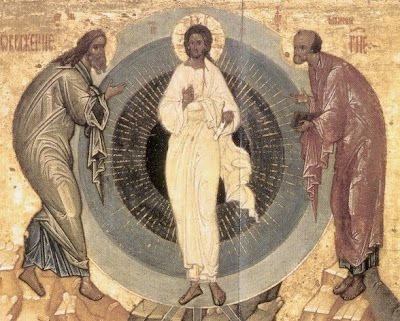 And in this Transfiguration the foremost object was to remove the offense of the cross from the disciple's heart, and to prevent their faith being disturbed by the humiliation of His voluntary Passion by revealing to them the excellence of His hidden dignity. But with no less foresight, the foundation was laid of the Holy Church's hope, that the whole body of Christ might realize the character of the change which it would have to receive, and that the members might promise themselves a share in that honour which had already shone forth in their Head. About which the Lord had Himself said, when He spoke of the majesty of His coming, "Then shall the righteous shine as the sun in their Father's Kingdom," (Matthew 13:43) while the blessed Apostle Paul bears witness to the self-same thing, and says: "for I reckon that the sufferings of this time are not worthy to be compared with the future glory which shall be revealed in us" (Romans 8:18): and again, "for you are dead, and your life is hid with Christ in God. For when Christ our life shall appear, then shall you also appear with Him in glory." (Colossians 3:3) But to confirm the Apostles and assist them to all knowledge, still further instruction was conveyed by that miracle. For Moses and Elias, that is the Law and the Prophets, appeared talking with the Lord; that in the presence of those five men might most truly be fulfilled what was said: "In two or three witnesses stands every word." (Deuteronomy 19:15) What more stable, what more steadfast than this word, in the proclamation of which the trumpet of the Old and of the New Testament joins, and the documentary evidence of the ancient witnesses combine with the teaching of the Gospel? For the pages of both covenants corroborate each other, and He Whom under the veil of mysteries the types that went before had promised, is displayed clearly and conspicuously by the splendour of the present glory. Because, as says the blessed John, "the law was given through Moses: but grace and truth came through Jesus Christ," (John 1:17) in Whom is fulfilled both the promise of prophetic figures and the purpose of the legal ordinances: for He both teaches the truth of prophecy by His presence, and renders the commands possible through grace. 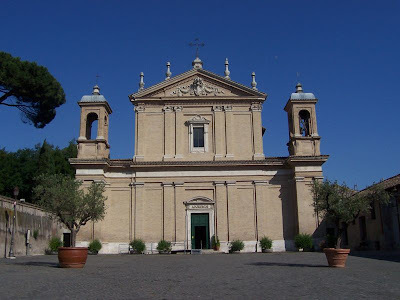 The church is believed to have originated in the 3rd or 4th century as a meeting-place for the first Christians of Rome and an institution for aiding the poor, in the home of the lady Cyriaca... It was built on the site of a Roman barracks. 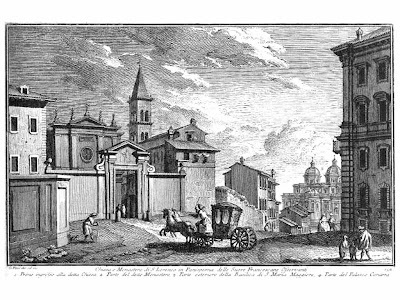 Her family's cemetery was where the basilica San Lorenzo fuori le Mura stands, and it was Cyriaca who arranged the burial of St Lawrence, deacon and martyr. St Lawrence used to hand out alms to the poor here. 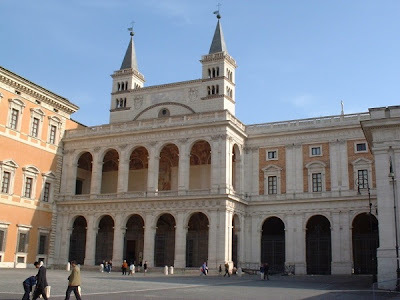 The present church is from the time of Pope Paschal I, who had it rebuilt 818-822. Many of the older elements were preserved, but side apses were added in the Eastern style. Alterations were made by the titular priest of the church, Giovanni Cardinal de Medici, who later became Pope Leo X (1513-1521), with Andrea Sansovino as architect. Fr. McDonald at Southern Orders offers a homily on the Transfiguration and how it sheds light on our understanding of the Mass. Our lives as Catholics are intimately bound to not only the glory of the Risen Christ, but also His passion and death. We are not yet in heaven. We will continue to get sick, suffer, sin and die because the work of redemption while complete in heaven is not yet complete in this life on this side of our Lord’s Second Coming. All the suffering, sins and deaths of those who ever have lived, are living or will live, are placed on Jesus during His entire earthly existence in the Flesh, beginning with the Incarnation through His passion, death and resurrection. Yet, not until the last person to be conceived will the Lord return, for He suffered and died for everyone who was ever or will be conceived. So we will continue on this side of life to need to be awake not only for the Glory of Christ in the Sacraments and in our lives, but also for the Passion of Christ in the Sacrament of the Most Holy Eucharist and in our lives and the lives of others. 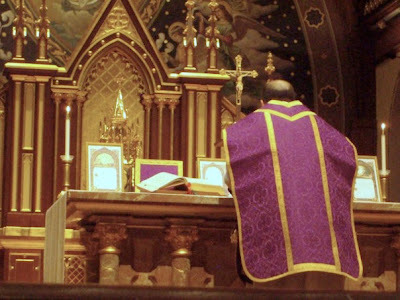 This has ramifications for the manner in which we celebrate the Ordinary Form of the Holy Mass. 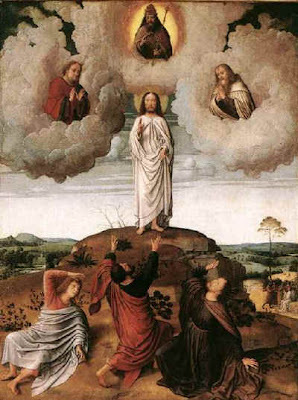 Is it a transfiguration experience for us, where we are filled with wonder, fear and awe, wanting to remain with Jesus or is it like the Garden of Gethsemane for us, where like Peter, James and John, we can't stay awake and drift into oblivious sleep? Maybe our eyes are open, but our hearts far from Jesus' passion, death and resurrection. 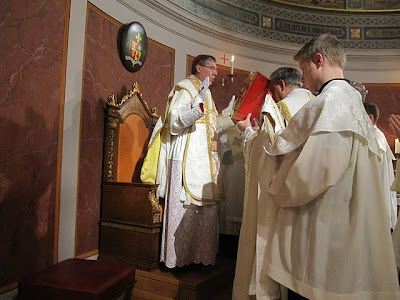 In late December we reported on a Solemn Pontifical Mass which was to be celebrated in Denmark by the Bishop of Copenhagen, Mgr. Czeslaw Kozon, in the Cathedral of St. Ansgar. (We have previously reported on this Danish bishop here.) One of our readers recently sent in some photos and video of this event. The Metropolitan Museum of Art is celebrating the splendour of the House of Valois with two exhibitions inspired by the opulence of the French and Burgundian courts at the turn of the 15th century. "Works created under the aegis of two of the greatest art patrons of the ­period—Jean de France, duc de Berry (1340-1416) and the second Duke of Burgundy, Jean sans Peur (the Fearless, 1371-1419), will fill the Robert Lehman Wing and the Medieval Sculpture Hall. 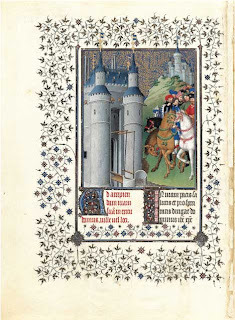 “The Art of Illumination” presents the first, and most likely the last, chance for visitors to see both sides of all 172 folios from the duc de Berry’s richly illustrated Book of Hours. "On their way to see the Belle Heures, visitors will pass a solemn funeral procession staged in the Medieval Sculpture Hall. “The Mourners” features 40 of the original 41 sculptures (one is lost) from the tomb of John the Fearless and his wife, Margaret of Bavaria. "John the Fearless commissioned the sculptors Jean de la Huerta and Antoine Le Moiturier to create a tomb that would rival that carved for his father, Philippe le Hardi (the Bold, 1342-1404)) by Claus Sluter. "The expressive alabaster statues, most of which are on loan from the Musée des Beaux-Arts, Dijon, are shown, double-file, in a procession on black plinths, which, according to curator Peter Barnet, is meant to evoke the black marble ledge on which the effigies stand in the tomb’s white stone arcading. “These works have never been on view outside France and outside the context of the tomb,” says Barnet. “Presenting them in a permanent gallery surrounded by other, contemporaneous works is something new for us." In the spring of 1965, my father had just turned 23, and was finishing his last semester of college; having spent a lot of his time at a California college on trips to Mexico (by his own admission), he became one of the original five-year planners. My mother, six months younger than he, had already graduated from the same school and returned to her native New York, where she was working as secretary to the associate publisher of National Review. Although it is not a religious magazine per se, National Review’s founder was one of the most prominent Catholic laymen in America, William F. Buckley, and many other famous Catholic intellectuals were regular contributors. My mother’s immediate boss, James P. McFadden would later found both the Human Life Review, and the newsletter Catholic Eye. I commence this commentary upon your latest hang-up, which is this ‘movement’ which is taking place within Holy Mother the Church. You’ve mentioned to me how shook up you are, and … things about joining some eastern rite and all that. (referring to earlier rebels in the Church like Arius as “fatheads”:) Remember, the cool ones have been those who knew that in spite of all that they saw around them, and what was happening within the Church, their first concern was to save their immortal souls; they worked within the Church. … One must be cool in these things and remember that on many occasions Christ has allowed the devil and his armies to turn the Church into chaos and turmoil, and that every time She has come out refreshed, rejuvenated, and as vital as Her Founder intended Her to be. You must remember that these factions, these creeping elements of fungus and disease have always been in the Church, and that every time they have lost in the end. Let them preach that we are to look upon Christ as a ‘buddy’, as you would say, but should that matter when you know that He isn’t? Look to yourself and not to them … So who or what is Ramparts ? (They) purport to represent the Church. Don’t tell me that you’ve fallen prey to the press and have believed them when they say that Ramparts or anyone else speaks for the Church. Let them yell, let them scream; they speak for no-one, and they speak to no-one. All they do is impress. They do not impress Protestants. They do not impress Catholic laymen. They only impress themselves and those like themselves…who are on newspapers and other such tripe… Just remember that all this will pass and the Church will emerge triumphant. At the time these words were written, the ‘hermeneutic of rupture’ was just getting into full swing. My mother’s parish had its first Mass celebrated partially in English; as she and my grandmother told me many times, most of the congregation left the church in tears. When my parents were married in 1968, they were unable to find a priest who would say any of their wedding Mass in Latin; years later, they were both deeply annoyed to learn (from me) that there was absolutely no prohibition, then or now, on saying any or all of the Mass in Latin. They moved to my father’s home town, Providence, R.I., where they lived for the rest of their lives. Our parish, Holy Name, practiced the ‘hermeneutic of continuity’ long before that phrase entered the common parlance of Catholic life. 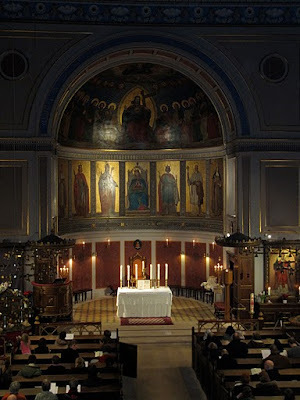 For many years, there was a Sunday Mass celebrated in Latin in the modern Roman rite with an excellent choir; in 1994, this was changed over to the usus antiquior. For my mother especially, one of the greatest joys of her life was the ability to once again regularly attend the liturgy she had known in her youth; time and again she told me that she never thought she would see the day. Both of my parents’ funerals were celebrated there in the traditional rite; so many of our family and friends told me how strongly moved they were by the beautiful music of the youthful and highly talented choir. In 1975, as my father predicted, Ramparts magazine ceased publication. 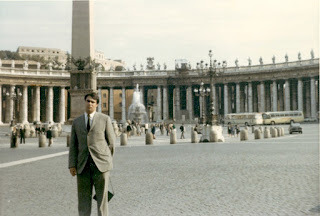 My father, Thomas DiPippo, in Saint Peter’s Square, July 1966. Apart from the cars, it looks just the same today, a fact he would really have appreciated. St. Mary in Transpontina stood, as ancient writers tell us, in capite porticus; that is to say, between the Aelian Bridge and the colonnade which led to St. Peter's. 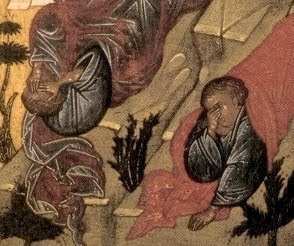 Near by was the terebinthus Neronis... 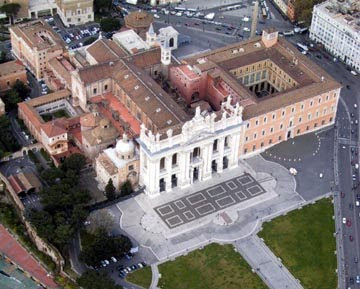 The church was destroyed, perhaps, under Pius IV (1559-65), and the one which now bears its name is not an ancient building, nor does it stand on the original site, but about three hundred yards nearer the Vatican. 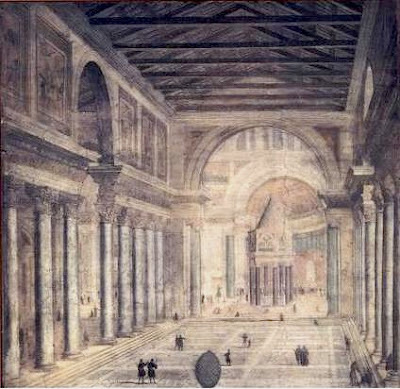 The station at the Vatican Basilica was prompted by the eminently Roman idea that every transmission of ecclesiastical power, through the conferring of one of the sacred orders, was derived from the supremem power of Peter... The surroundings were especially inspiring. That ancient basilica... was the monument of the victory of Christianity over Paganism, on the very spot where Nero crucified the first Pope. The story of the basilica starts with the martyrdom of Peter. It is built on the site of the Circus of Caligula and Nero, where the Apostle and first Bishop of Rome was crucified in the year 64 or 67. Peter was buried in the cemetery next to the Circus. In the second half of the 2nd century, a monument was erected over St Peter's tomb. Eusebius of Caesarea, Church historian and Bishop at Constantine's time, referred to it as a trophy symbolizing the Apostle's victorious faith. Part of this memorial is still visible in the crypt. It was originally 1,80 meters wide and 2,30 meters high. The 3rd century memorial to the Apostle remained the center of attention. It was set in a rectangular, marble-coated prism which was visible from the nave. Through an opening in the pavement, objects such as strips of cloth could be lowered down to the monument to make relics. The monument was surmounted by a bronze canopy supported by four twisted columns. 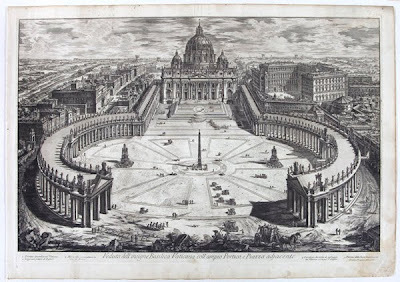 In front of the basilica was an atrium, with a fountain in the shape of a pine cone. The façade had rich mosaic decoration showing symbols of Christ and the Apostles. Inside the basilica, the nave was about 91 metres long. It ended in a triumphal arch, with mosaic decoration showing Constantine donating the basilica. 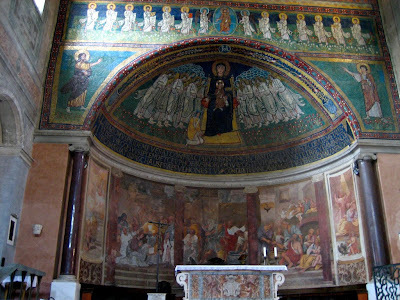 Beyond that, the apse has a mosaic depiction of Christ with Peter and Paul. 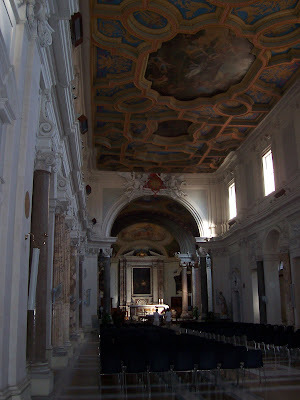 On the walls of the nave, there were frescoes showing scenes from the Bible, as well as portraits of the popes. 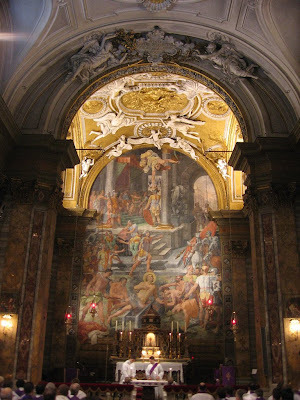 Under Pope St Leo the Great (440–461), the façade and nave were decorated with mosaics and frescoes. 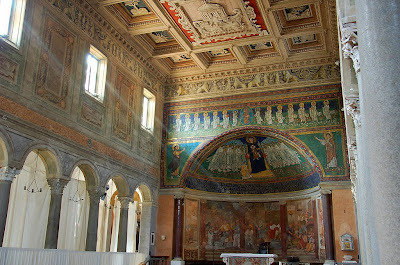 The sanctuary was altered by Pope St Gregory the Great (590–604). 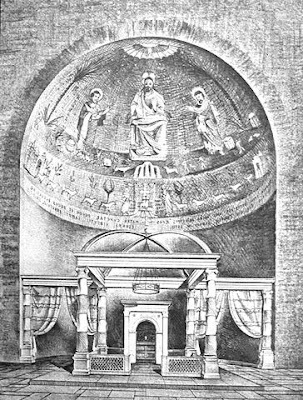 By raising it 1-1.5 meters, he made it possible to build the first semi-circular crypt. This made it easier for pilgrims to venerate the tomb of the Apostle, as they could now approach it by one staircase and leave by another. The high altar was moved to the confessio, exactly above the tomb. 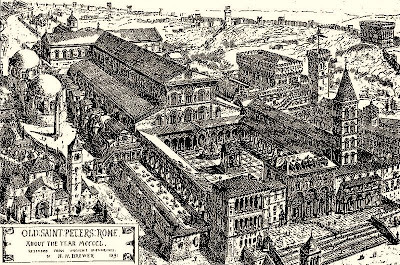 Pope Leo IV (847–855) built walls around the area of the basilica, to protect it from raiding Saracens. It was therefore given the name "Leonine City". 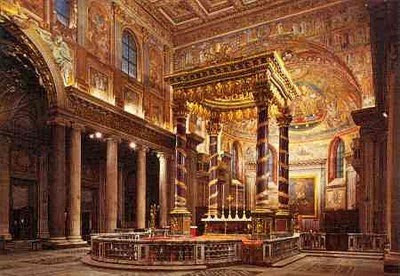 The sanctuary was raised further under Pope Callixtus II (1119–1124), to protect and preserve respect for the shrine of St Peter. In 1377, when the papacy returned from Avignon, the Vatican was made the official residence of the Pope. 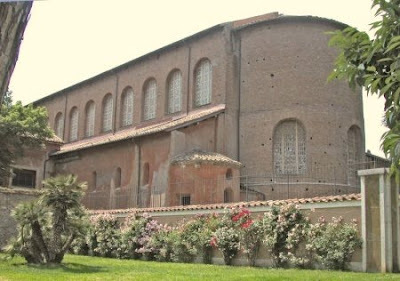 The basilica was in a bad state by the time of the papacy of Nicholas V (1447–1455). He asked Bernardo Rossellino to design a new church. Work started 1452, but at the death of Nicholas V in 1455 it was suspended for nearly 50 years, with the exception of some activity during the papacy of Paul II. By then, they had not gotten further than demolishing the old basilica. It was Pope Julius II (1503–1513) who finally started work on the new basilica. 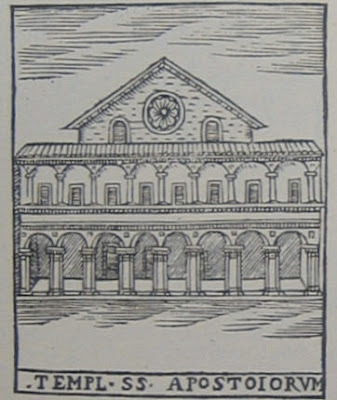 Donato Bramante was given the job of designing it. He designed a Greek cross plan, with a large central dome. At his death in 1511, Raphael, Fra Giocondo da Verona and Antonio da Sangallo were commissioned to continue. As more space was needed, a longer nave was added, creating a Latin cross plan rather than a Greek cross. As the last of the three new architects, da Sangallo, died in 1546, Michelangelo was asked to complete the church. 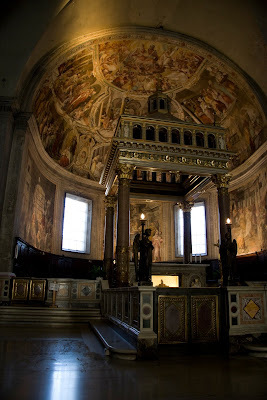 He attempted to return to Bramante's design, and it is mainly in the area of the apse that his work can be seen. He also designed the main dome, but died before it was completed. Vignola followed, and then in 1573 Giacomo della Porta. The dome was completed by Domenico Fontana in 1589, and inaugurated in 1593. 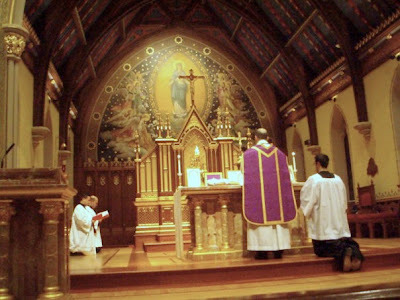 Recently it had been reported that at Seton Hall University, a series of Masses were being offered, alternating between the usus antiquior and the modern Roman liturgy (in Latin -- and possibly with other expressions of liturgical continuity, though I have not heard a formal report about this). In follow up to this, an update came in this evening from one of our readers, where they note a good attendance at the Masses on the part of the student population, and the participation of both seminarians and lay students as servers to the Masses. One of our readers sent in this video which shows a recent interview on EWTN of two members of the FSSP by Fr. Mitch Pacwa. The interview speaks about the FSSP, the matter of the sacred liturgy, the EF and OF, and about the forthcoming consecration of the new chapel at the North American Seminary of the FSSP. It is overwhelming to think of the resources that have become available for Catholic musicians in the last few years. The latest is a glorious series of books that offer complete Gregorian-based propers of the Mass in English, by G.H. Palmer and Francis Burgess. The notation looks exactly like the Vatican edition of 1908. The language is high, from the older translations of scripture. 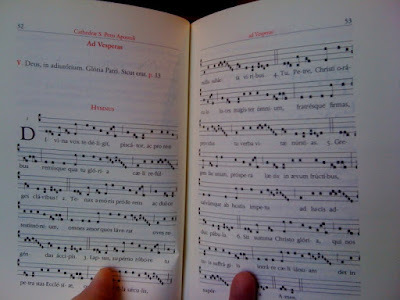 It isn't correct to call these editions Gregorian, since the melodies were of course written for Latin. But these editions preserve those melodies but put them in a different language. The effect is marvelous. 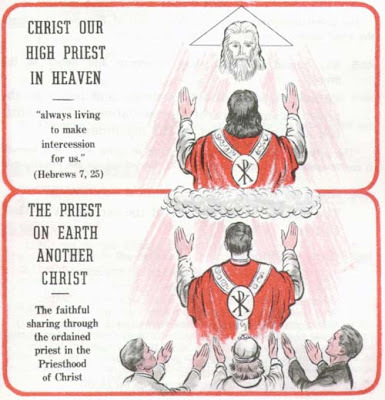 The editions have been time tested in Anglo-Catholic parishes where they have been in use since the 1930s, thanks to the publishing work of the Community of St. Mary the Virgin in the UK, which gave permission for their old books to be posted for use in Anglican and Catholic congregations. When they were released, the shouts of hosanna from musicians were audible. Many parishes in the Anglican tradition had been used photocopies of photocopies of these books and they were growing dimmer by the day. The Church Music Association of America scanned originals into very high resolution so that they can be used by anyone around the world. 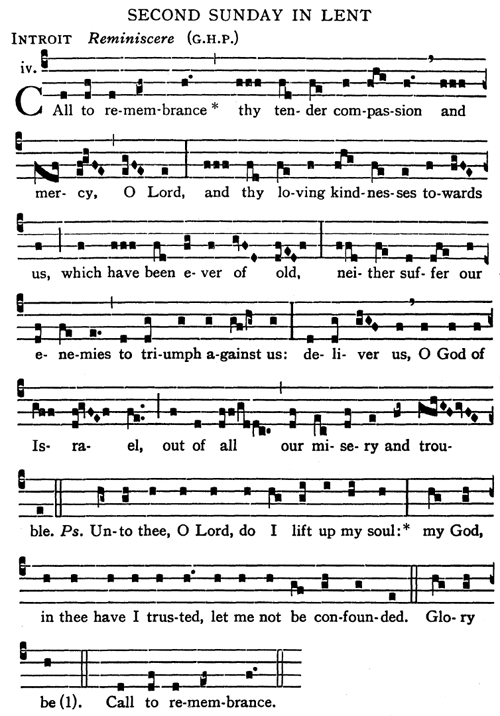 The first I had seen of these chants was two years ago, at the CMAA Colloquium, when William Mahrt passed out a single Psalm chant. I was amazed to see this and wonder where it came from. Then choirmaster Owen Burdick wrote me looking for them. I expressed frustration that they were not available. He went looking through the attic at Ascension in New York and turned up four full books, left behind by his predecessors. They were promptly sent to the scanners and then released to the world. 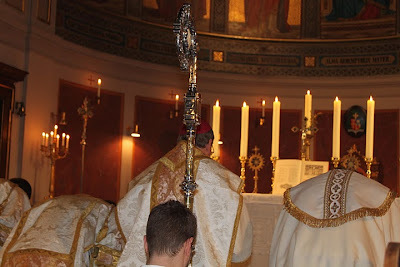 A Catholic who sees these has to wonder: is this what Vatican II intended for liturgy? I think the answer is complex. On the one hand, the documents are absolutely resolute in calling for Gregorian chant to have first place at Mass. Gregorian is in only one language: Latin. Anything else does not go by that name. So the Council was firm here: there would be no compromise on Latin propers and ordinary chants. On the other hand, the Council permitted the vernacular to be introduced into liturgy. The extent of the translations and introductions were to be determined by the national conferences. So you can see the tension here: it wasn't entirely clear what the liturgical goal was. There were notable contradictions at the heart of the documents. To be sure, had the national conferences been faithful to the letter and spirit, that would have been one thing. But for the Vatican to relinquish responsibility over the language of the liturgy at this time, in this culture, was a recipe for the unraveling of the Roman Rite (speaking in hindsight, when everything is clear). And guess what the U.S. did? No surprise: the U.S released editions of the Missal that were largely English by 1965. I say largely, but the results were rather confused: the ordinary and the readings were in English (strange since the people knew the Latin ordinary rather well) but the propers were in Latin that edition of the Missale Romanum. What's more, everyone knew at the time that this was a transitional Missale and not stable. Many serious musicians saw the writing on the wall and got to work writing chanted propers in English. Sometimes they wrote new melodies that fit the text. Sometimes they wrote originals chants only slightly adapted. It is unclear whether anyone in the Catholic world at the time understood that so much work had already been done in this area by Anglicans many years earlier. The efforts had grown out of the Oxford movement in Britain in the 19th century, with the goal of purging the puritanism of Anglicanism and making its liturgical presence more Catholic in presentation, even while preserving the English tradition. If vernacularization was the goal, the structure was already in place, ready for the taking. But the politics and culture of the time mitigated against it. Most of the advocates of the vernacular envisioned something very different from what the Second Vatican Council actually called for. They want groovier style, a casual manner, a Mass that the people would effectively shape themselves according to their own will, culture, and desire. The language was just the starting point. What they really wanted was to tear up the entire pea patch of tradition. Meanwhile, on the other side were those who were attached to tradition and had very little interest in seeing the amazing treasure of chant, which the Council had already stated was of "inestimable value," hacked up to accommodate the latest populist push by the emergent generation of hippies and groovemeisters. They were correct in being deeply suspicious of the vernacularization movement. They dug in their heels and defended tradition. I think often of these days and I suspect that I might have been among this group. But here was the interesting dynamic that was generated by this great divide. The advocates of a chanted English Mass had no energy or powerful sector behind them. One might say that they were the moderates but in those days no one was much interested. In the intervening five years, the battles waged on with the clear winner emerging by 1969 when the new Missal was released by the Vatican. The national conferences got to work on their translations. Everything happened too quickly and what emerged on the other end was a template for disaster. Recall that after the Council closed, most serious Catholic musicians were ecstatic. At last, a Church Council had definitively declared that Gregorian chant must have first place. At last, something was going to be done about the pervasiveness of vernacular hymnody at the Low Mass of old. The sung Mass would be the norm. By 1975, however, the world was completely unrecognizable. Not only was vernacular the norm, but hymns were the norm, and not the old-time hymns but new stuff written in commercial stylings, with structures and tunes taken from sit-coms on television and soap ads on television: unworthy doesn't quite describe the music that has been pervasive since these days. There were other factors. The calendar upheaval delayed the publication of the Graduale Romanum for the New Mass, for example. A new translation was issued by ICEL that departed dramatically from not only the Latin but the English that was used in the 1965 Missale. 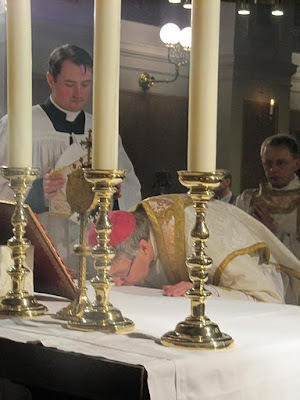 There was the still-inexplicable introduction of brand new set of propers for spoken Mass as versus sung Mass: a fissure that is no closer to be healed today, mainly because not even most Bishops are even aware that it exists. There was this new animal called the "Resposorial Psalm" which change the whole structure and purpose of the music between the readings. There are probably many other reasons for the meltdown but the bottom line is that the opportunity for a chanted English Mass was entirely bypassed. In the intervening years, not much has happened toward making good on the early promise here. However, in the last two years or so, many versions of music for Mass have gone online that use English and chant, all for free download. Last count, I believe that there were seven complete sets of these available. They are all remarkable resources and should be used by every parish starting this week. They all have musical and theological integrity and adopt the right style for liturgy. They all use music that is pointing upwards and conform to the definition of sacred music as outlined by St. Pius X. For us today, that serve as an essential means for leaving the current and mostly corrupted model and going forward with something closer to the Roman Rite of the ages. What I like most is that they all point to the ideal, which is found ultimately in the Graduale Romanum. Thus has the time capsule been opened to reveal treasures that have always been there but we knew very little about. It is morally incumbent on our generation to make use of them, so that justice is done in liturgy and life. There are many things about the liturgical past that are regrettable but repeating these errors without end need not be our future. 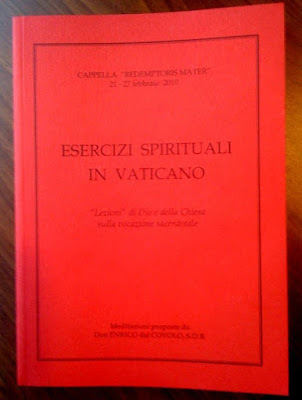 As part of the revival of Vespers at the Vatican, in the hopes of spreading this liturgy throughout the world, the Vatican printed a special book of spiritual exercises for this Lent, based largely on the new Antiphonale from Solesmes. It incorporates all the work of the last 15 years toward the release of the sung Vespers. This book is an offshoot of that work. It is being used daily at St. Peter's. If you see pictures of the many gathered for these exercises, you will see this book. Here is a lovely edition, in Latin, sent to me by Dom Cuthbert Brogan OSB. 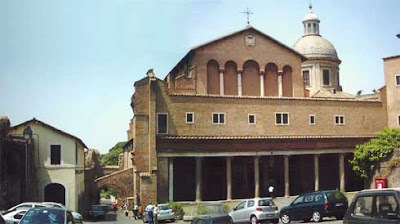 On this day, in the ancient Roman liturgy, the second scrutiny of the candidates for the priesthood and diaconate took place; it was therefore proper that after the station of Wednesday at the Basilica of Our Lady on Esquiline [St. Mary Major], the Church should invoke the protection of the whole Apostolic College for those who continue their great mission upon earth. 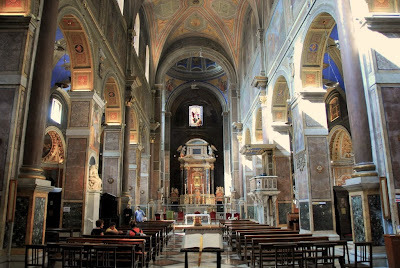 In the venerable Basilica of the Holy Apostles -- built by Pelagius I (555-60) and dedicated by John III (560-73) as a votive offering for the deliverance of Rome from the Goths by Narses -- are preserved the relics of St. Philip and St. James. 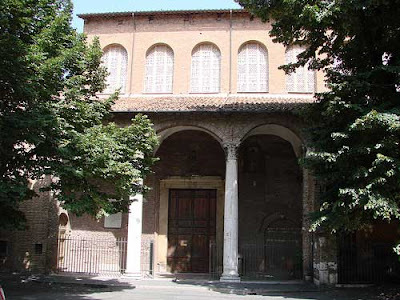 The first church on the site may have been founded in the time of Pope Julius I (337-352); there are indications of this in the Liber Pontificalis. However, the first church we have certain knowledge about was founded by Pope Pelagius I (556-561) in commemoration of a victory over the Goths and their expulsion by the Byzantine viceroy Narses. It was completed by John III (561-574), and dedicated to the Apostles St James and St Philip. It was restored by Pope Stephen VI (885-891). In 1348, the church was severely damaged by an earthquake, and had to be abandoned. It was again restored in 1417 by Pope Martin V, whose family, the Colonnas, owned the surrounding area. 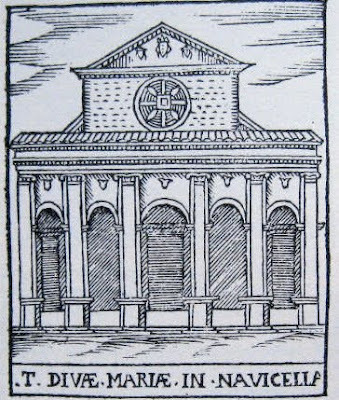 The church was considered almost as the family chapel of the Colonna family. 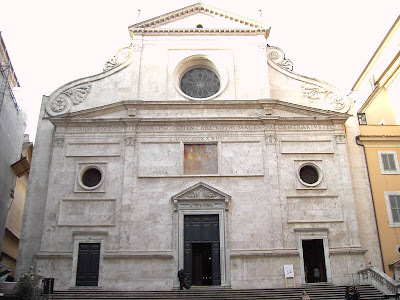 The façade was rebuilt in at the end of the 15th century by Baccio Pontelli. The church was rededicated to all the Apostles in the 16th century. 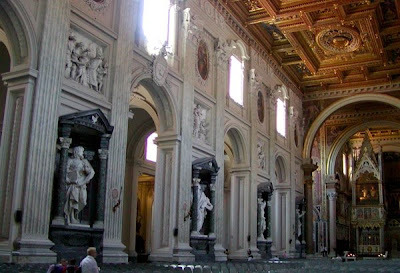 His design was changed when Carlo Rainaldi walled up the arches on the upper level, changed the windows into the Baroque style and added the statues of Christ and the Apostles in the 17th century. 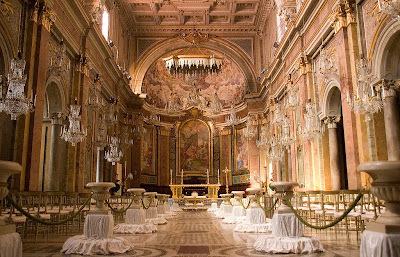 A new restoration took place under Pope Clement XI (1700-1721), carried out by Carlo and Francesco Fontana. The present façade was designed by Valadier in 1827. Following my own advice that it is never too late to get started on a good Lenten project, it struck me today that, while many of us are not so blessed as the men of the Pontifical North American College, to be able to make pilgrimage each day to the Roman stational churches, we might at least do it online by seeing these churches on their proper day. For those who are unfamiliar with the stational churches, or only vaguely familiar, do watch for a forthcoming NLM article where we intend to explain a bit about the history of the stational churches. 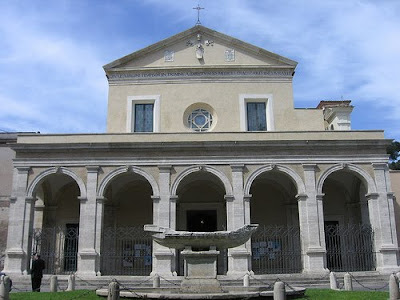 Santa Maria in Domnica is also known as Santa Maria alla Navicella and is dedicated to the Blessed Virgin Mary. 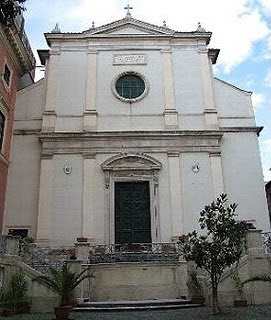 The church is believed to have originated in the 3rd or 4th century as a meeting-place for the first Christians of Rome and an institution for aiding the poor, in the home of the lady Cyriaca. The name is thought to reflect its origins, as 'domenica' is probably a corruption of 'dominicum', a common Latin word for 'church', and especially for house-churches. It was built on the site of a Roman barracks. 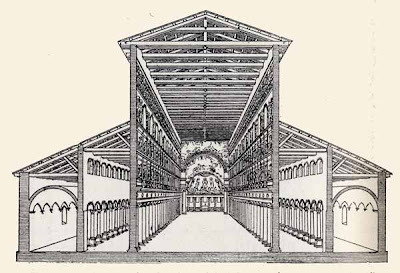 Her family's cemetery was where the basilica San Lorenzo fuori le Mura stands, and it was Cyriaca who arranged the burial of St Lawrence, deacon and martyr. St Lawrence used to hand out alms to the poor here. 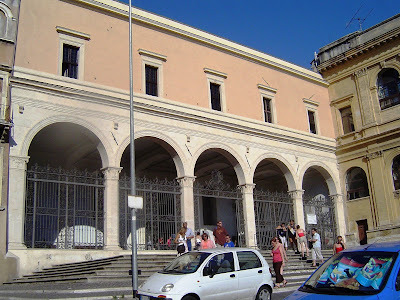 It got its alternate name Santa Maria alla Navicella after the small marble boat (navicella) in the piazza. The boat is a 16th century copy of an ancient one. The copy was placed here by Cardinal de Medici. Among its titulars were Popes Stephen IX, Gregory VII, Clement VII, Tommaso and Giovanni Battista Orsini family, Innocenzo Cardinal Cybo, Federico Borromeo sen. (died 1589) and Tommaso Riario Sfroza. At the present time, the titular priest of the church is H.E. William Joseph Levada.